With its own built-in oil reservoir for the high pressure output, the IP16 can handle circuits with extreme back-pressure in the oil return lines. As an added bonus, tools won’t receive contamination from the truck circuit. Also, the oil in the IP16 will maintain its dielectric qualities far longer. The unloader valve in the IP16 sounds an audible “click” when the preset pressure has been achieved assuring accurate die loads, crimp after crimp. 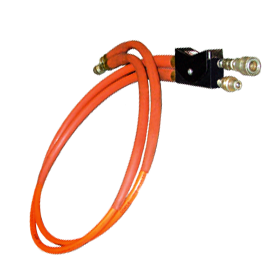 The IP16 Intensifier provides up to 10,000 psi/690 bar of adjustable hydraulic power. The Stanley RV06 Rocker Valve makes the use of single or double acting crimping and cutting tools more convenient than ever. Simply press the forward end of the rocker to advance the tool piston or depress the rear section of the rocker to retract the tool piston. RV06 is spring loaded to the “neutral” or “hold” position so when the rocker is released, the piston will remain in the position you desire. The smooth, precise action of the rocker allows the operator to maintain full control while “feathering” the rocker in both advance and retract mode.